One morning last week I lay on the acupuncturist’s table, stuck like a pomander, trying to identify the familiar yet elusive note that carries Mary Greenwell Plum. It wasn’t plum — that much I knew. Maybe it was the lobotomizing New Age music or maybe the needle planted smack in the middle of my forehead, but the answer came to me all at once: Smuckers. Smuckers grape jelly, to be precise. Mary Greenwell Plum hit the market in October 2010 and quickly became a must-sample fragrance. It had a lot of promising features: its perfumer was François Robert, accomplished nose and descendant of the legendary Guy Robert and Henri Robert; it was a chypre; and it was hard to find. Plum’s top notes include English plum, blackcurrant, peach, bergamot, lemon blend, gardenia, tuberose absolute, orange flower absolute, rose absolute, jasmine absolute, precious woods, sandalwood, oakmoss, patchouli, amber, and white musk. What I smell is an aldehyde-boosted mix of grape jelly and gardenia grounded by oakmoss and clean musk. Some reviews don’t find Plum to be much of a chypre, but to me it does ring in as an old-fashioned chypre. But it has a hole in it. I smell lots of nose-tingling grape jelly mixed with gardenia (reminding me just how fruity gardenia is) and the dirty, almost tarry mossy base washed with soap. Plum has lots of high notes and low notes, but for me not an entrancing heart. It’s just — purple grapes. So, for a full picture of Plum, let’s go back to the grape jelly. Imagine the grape jelly in single-serve packets, the kind you get in a diner. Now picture a woman of a certain age, a smoker, who tucks a few of these grape jelly packets into her purse and forgets about them. After a week, the warm fruit of the jelly packets combines with the cosmetics smell of her lipsticks, hand lotion, and a perfumed handkerchief. A bruised guest soap pilfered from a hotel floats around with it. The fragrance of old cigarettes infuses the mix. Presto: Plum. I’m glad I smelled Plum, and I’m glad it’s out there for sale, but it doesn’t suit me. It feels too mature, too insistent for me. (It lasts a robust six hours with generous sillage). Plum might better suit someone who holds regular appointments at the hairdressers, is comfortable with a perfume featuring a strong violins section, and who smokes. And it’s certainly not a good one to wear during acupuncture. 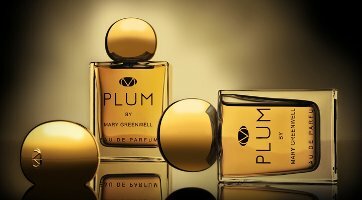 Mary Greenwell Plum is available in the United States at Luckyscent. It’s $100 for 50 ml Eau de Parfum and $150 for 100 ml. In the U.K., Plum is also available in solid parfum (£70), as a 7.5 ml purse spray (£25) and as a candle (£36). Thanks for sharing your take on Plum, Angela. It is one of my favorite releases in recent memory and I suppose it doesn’t hurt that I also love plum/grape notes in perfume as well. I love the modern feel of the fruit against the more traditional chypre background because it doesn’t feel like it is trying to be another fruity-floral but more its own unique creation. And I’m practically the opposite of the demographic you thought it might suit (youngish, don’t smoke and am far more into DIY beauty both for price and experience), but Plum makes me feel like I’m splurging just by spritzing some on and I’m cherishing the little bit remaining in the purse spray for which I swapped. Also, given that my skin seems to eat all perfumes lately even the powerhouses in my collection, I can at least reliably count on Plum to still be there a few hours later with decent sillage, which I love. One petite spray in an inconspicuous place just isn’t me, and Plum is a fragrance that seems to appreciate that sensibility. It sounds like you found the perfect perfume for you! I clearly need to smell it on your skin rather than mine, where it didn’t do much exciting. I love it that they have a purse spray. I found this to be hugely disappointing. The billing as a chypre excited me a lot but it was (to my nose) just a generic department store fruity white floral over musk. I don’t even smell oakmoss. Boy does it last though – trying to wash it off made no difference at all. Its longevity is pretty amazing, true. Just yesterday I put on a sweater I wore last week and it was still going strong. Me too. I didn’t like it too much . With plum and peach listed as notes, I had wondered if this one would resemble Rochas Femme. I gather not! I will stick to Femme. Your review makes Plum sound rather ambivalent, both too clean and too dirty, too young (grape – urrk!) and too mature. She’s certainly a strange lady, wandering around with jelly and soap in her bag! It’s definitely not Femme! Yes, I’ll stick to that one, too. I love your observation that it’s such a very young, yet mature, fragrance. You’re right! Angela! Why are your reviews so consistently wonderful? I have absolutely nothing of substance to add except that I adore you and want to have your literary babies. Please never stop writing. Ha! Needed to be said. It is a fabulous review. Manages to say – and imply – so much in a very short space. Don’t dunk your head! It makes me feel great to know someone likes my reviews. Thank you so much! I love your reviews too. You make me want to sample almost everything you review whether you love it or hate it. I’ve even considered blind buys. There are some waiting in various shopping carts at this very moment just waiting for me to buy in a weak moment. The fruitiness of Plum has scared me off a bit but it seems the reactions to it are so very different I almost want to sample it just to see what I get from it. Fruit or flowers or neither. I like the idea of long lasting sillage too. I’ve been surprised at how different Plum seems to be ringing in on people! It’s fun, though. I’d be interested to know what your skin does with it. Those blind buys can be deadly. Take it from the voice of experience. I have nothing to say re: Plum, as I haven’t sniffed it and don’t imagine I will get too, but I DO want to chime in here that your reviews are fantastic, and among those I looks forward to the most, regardless of what’s being sampled. Thank you so much! It really feels great to think people enjoy my reviews. I, too, was disappointed especially after reading so many raves about it. It was just a little too crude, a little too radiant (okay, loud) a little too…too everything, y’know. I detected no traces of plum. I guess I was hoping for something like AdP Profumo (a proper plum chypre) or Memoir Woman (I get a strong plum/prune vibe from it) and it was more like Coco Mademoiselle and Miss Dior (Cherie). I love hearing how everyone reacts so differently to Plum! Anything like Profumo I would run at with my credit card. I do love that one! OH THANK GOD that I don’t get grape jelly! Plum’s a favorite of mine. For me, the top is very tangy fruit (not froot, and not even plum, unless it’s unripe yellow plums) moving into big bouquets of white flowers – tuberose, jasmine – along with rose, atop a leetle slice of a classic chypre base. It’s mostly middle on me… fifteen minutes of tangy fruit, four hours of flowers, and an hour of modern-chypre. I’m starting to wonder if this is one that’s particularly skin sensitive? I barely detected any flowers except gardenia, and grape was front and center for me the whole danged way through. I bet Plum is one of those shape-shifting fragrances depending on your chemistry. mals, I was going to post my take on plum until I read your description and my reaction is the same as yours! I only get fruit for 15-30 mins and mostly the middle white flowers the rest of the day. I do really like this one, and its so interesting to see all these different reactions. I’m fascinated, too. Is any of the fruit you get grape? Angela, I do get plum (or what I think is plum). I find the opening very similar to elie saab on me, and then they each go in different directions after the opening. Hours later I do get a hint of grape jelly accord, but I wouldn’t recognize it as such if you didn’t put the image in my head! Btw, I too love reading your reviews, they are always fun to read and imaginative! Uh oh, I hope the grape jelly reference doesn’t spoil the fragrance for you. Sometimes once I associate a smell with a label I’m not crazy for, the perfume is wrecked for me. Yikes, Angela. I’m so sorry that Plum acts that way on you! It sounds rather terrifying, as does your picture of the woman it might suit. I’m among those who like it very much. I promise that I would never pilfer jelly packets or soap and that my handbags are quite tidy. Don’t smoke, either. I would sing Plum’s praises but can’t improve on what Absolute Sensualist and mais86 have said. They seem to be smelling the same Plum that I do. I’m glad Plum is a hit on you! Someday I want to see a good, thorough study of the impact of skin chemistry on fragrance, because I’m telling you, on my skin it was a fail. The description of the woman who would wear this describes my co-worker, Michelle to perfection. I immediately forwarded this to her and she cracked up so hard she started choking. Hey, I hope she gets to sample it some time! On me, Plum was indeterminate fruit (more peachy than grape Smuckers-y, thankfully) and a tiny bit of lemon, followed by a prodigiously loud and tenacious gardenia. I waited about eight hours for the chypre to emerge, and when it showed no signs of doing so, I washed the whole thing off. I didn’t get any aldehydes, either. Love the bottle, though. I wonder if the gardenia on you is what comes through as so grapey on me? “Prodigiously loud and tenacious” describes the grape (on me) well. The bottle does look nice. It reminds me a little of the Laura Mercier bottles. Fabulous review, Angela. I sought out Plum soon after it was released here in the UK, dabbed my sample and…..nothing. No grape Smuckers just generic floral with sweet tuberose. No chypre, no oakmoss, nothing. I was so disappointed as it smelled wonderful on two girlfriends of mine but was not to be for me. I consoled myself with a hearty spray of Eau Premiere! Eau Premiere is very nice consolation! It sounds like Plum behaved on you like it did on me! Your visions would have made a good Rod Stewart music video in the 1980s, by the way. Grape jelly? How interesting it is how differently we all perceive scent! Plum on me is definitely not plum, but also definitely not Smuckers. I’m actually wearing it today; it’s white flowers over amber and a smidge of patchouli. I’m beginning to think the gardenia in Plum skews grape on some (me) people. The fruitiness of gardenia could splash either way depending on how it’s put together, it seems to me. And you are on the lucky side! I get no grape or tobacco from this. To me, Plum just smells really pretty. Nothing deep, but fun to wear. But it’s AWFUL on me! Purple grape juice, aldehydes, and cigarette butts. Sadly. For the record, Hiris smells like dirty hair on me. Clearly your skin is more forgiving. Well, I actually like perfumes with costus, which is supposed to smell a bit like dirty hair, so that explains it! I’m a big fan of Fille D’Eve, which features costus, but somehow Hiris is a little different. But I do love iris. You know, I really need to give Hiris another try. I bet I love it this time. It’s been a few years since I’ve given it a fair shake. I adore this review, Angela! But I think I will pass on the fragrance — though I must say you’ve intrigued me, as usual! Everyone seems to experience this fragrance differently! Who knows? Maybe it would be great on you. But it’s a pass on me. The lovely Mals sent me a generous sample of Plum which I intend to spend more time with. For me, Plum smells for all the world like Chanel Cristalle EDP + indeterminate purple fruits. It’s like they cut out most of (maybe not all) the lemon and citrus in Cristalle and replaced it with purple fruit. Now, Cristalle EDP is one of my favorite perfumes of all times and has many of my favorite notes. And I’m not necessarily opposed to purple fruit on principle, or anything. So… I don’t know, I think the jury’s still out. Maybe if you’re not blown away right away, it’s a good sample to stash away for a few months and then try again. I know for me sometimes I’m not sure how I feel about certain samples immediately. But how nice that Mals sent you a sample! That’s kind of what I’m thinking! Come back to it in another month or so. Interestingly, I get a faint tobacco leaf note from Cristalle. Maybe there is some common material there that is noticable to some and not to others. And a lot of scent perception goes on in our brains, or course, not just on our skins. I’d love someone to do a test and switch a scent and it’s list of notes with another one. Then I’d love to have people read the notes and smell the fragrance and tell what they smell. I wonder how many people are swayed by the list and would say they totally got certain notes when they are not even there. My nose plays tricks on me and sometimes I think I smell certain notes because I am told they are there. The brain has a lot to do with it I think. I think that would be a fascinating experiment. I know I’m really suggestible when I see a list of notes. That’s a really interesting idea, Poodle! I’m sure my nose plays tricks on me too. I sometimes associate the base of a chypre with cigarette butts, which makes sense with Cristalle. Funny you mention that – I get definite ashtray from Cristalle. Thank you for the great review, Angela! Although I am into gourmand fragrances, your review has made me think twice. MG Plum. Where to start. Actually, the start was Mals. It’s all her fault. She made it sound so appealing and, well, off the cliff I went. Blindly. But for once, it went well. Very, very well. I love it. I do not get any grape jelly or grapes. In fact, I was surprised to read that anyone gets grape out of it, not that I’d mind grape, I guess, but it just isn’t there for me. I get some fruit at the start (but not any specific identifiable fruit), but mostly I get the white flowers, which last and last and last. I’m soundly convinced that the gardenia skews grape on me and stays white flower on others. It makes sense when you think of its fruitiness. But I’ve had gardenia stay gardenia before! At least Plum is a success on you. On me, Plum is a fruity tuberose floral (or tube-gardenia mix) with a woody base, very very similar to the original Juicy Couture but more complex in the opening and with (probably) better materials. I definitely don’t see the chypre connection. I like it (and I like Juicy Couture!) but it wasn’t at all what I was expecting. Juicy Couture is a lot easier to find–and less expensive! Although I sure do like the Plum bottle. You made me giggle at your lovely sketch! I am afraid Plum just doesn’t appeal to me either, and I so wanted it to, having bought it unsniffed just because it sounded like my sort of thing. To me it smelt like Poison with a dose of Fracas and gave me a headache immediately. Being a glutton for punishment I go back to my bottle for another dose every few months, but it doesn’t get any better. I can only assume that it is just one of those that really suits some people, but just not me. Poison crossed with Fracas is a great description! I’m with you in that it doesn’t suit me, either. “A strong violin section” – what a great description! I like a strong violin section in a perfume, but don’t know whether I’d like grape jam along with the strings. Maybe I’d prefer Plum to smell like plum. I kind of wish it smelled like plum, too. I don’t think I have a good plum-infused fragrance in my collection! I adore Plum and believe it suits me.I don’t get any gardenia (if I did I couldn’t bear it because I absolutely abhor gardenia). I get a beautifully warm and cuddly perfume whose drydown is addictive. It *is* ‘perfumey’ and a bit strong for daytime, but nothing has excited me so much since Tubéreuse Criminelle. I bought the small purse spray as soon as it came out over a year ago. I’ve always loved Mary Greenwell: she’s a very kind person. She made me up once in Selfridges, years ago. She was doing public makeovers and was waiting for her next appointment (I didn’t have one). I went up to her and asked why magazines never mentioned make-up for women with my colouring (pale skin, darkish eyes, very dark eyebrows and white hair). She insisted on sitting me down and demonstrating what I should be doing and what shades I should be using. She used her large hands to apply everything. She was lovely and fun. I bet the perfume in question is something I used to wear too. She sounds delightful! I’m jealous of your makeover. It makes me like her even more. It’s great that she thought to have a purse spray, too. Sometimes that’s the perfect amount–or the amount the budget can accommodate, at least. She really is a nice person. Even before I met her, I thought she looked gentle – and she is. The purse spray was exactly the amount of perfume I wanted (I’m still wedded to Tub Crim – just unfaithful with Plum from time to time). Problem is, the actual thing is sooo heavy, no way would I carry it around in my handbag. LOL! It’s always good to have something weighty in your handbag, you know, just in case you need to swing it at an assailant! What a great experience. It must the perfume extra special for you. Yes, it does. It probably made me biased towards it too. But, truly, that drydown is unbelievable. I’m so late to this one, but must chime in. Another nod to Mals, whose praises for this perfume has had me supercurious for a sample. I did finally get one early this year and just recently opened up the vial to try. I don’t know what that mystery fragrance was and whether or how it relates in any way to the end product, but when I first applied the edp on skin, my first reaction was Laura Ashley’s Dilys from the very early ’90s. There was a similar playful and unusual fruity character, and I immediately went to find my little treasured mini, a GWP from a purchase of L.A. No.1 from that same year. On a side by side compare, it was quickly apparent that they are not the same, and Dilys has not the mossy chypre base of Plum. Still, they carry the same spirit about them, with Plum as the more sophisticated older sibling. I don’t find this perfume to be earth shattering, just a very lovely and fun fragrance that doesn’t fall into the generic fruity floral, or sugary sweet or vanilla-y, or strange categories of most fragrances today. Bela is right, that drydown is quite lovely. Thanks for the review, Angela, and it’s nice getting to know a little more about Mary Greenwell. I never have tried any of the Laura Ashleys, but now I’m curious! There’s something very nice about having a lovely and fun fragrance. Not every perfume has to be gorgeous–in fact, sometimes it’s just too demanding, I find. Angela, I’m wearing this fragrance today, and I know which fragrance Mary was in love and tried to replicate: Chinatown. This is her Chinatown version, more floral, less mossy, a little bit less fruity maybe. But i’m pretty sure that it’s my loved Chinatown. I suspect that the grape aroma you smell is an illusion created by the plum mixed with the orange flower (and maybe the tuberose too). It’s an amazing fragrance, for sure, a more floral Chinatown, and better priced. What a fascinating comparison–I never even thought of it. I’m going to wear them side by side and note their similarities. Thanks! Thank you! I have still yet to try the combo (must local my Plum sample) but I will!